Kirsten Nunez, MS is a health and lifestyle journalist based in Beacon, New York. Since 2014, she has contributed to over 15 digital publications. Her work has appeared on nutrition and health websites such as SparkPeople, CureJoy, and Healthline. Kirsten has a Master of Science in Nutrition and Bachelor of Science in Dietetics. Siddhi Camila Lama is an independent science writer with a PhD in Bioengineering from MIT-Portugal. Her writing has been featured on Medium, Cannabis Wire, and BrainFacts. She currently writes for the Science of Success and Holtorf Medical Group. Slightly bitter and fizzy, tonic water is a carbonated beverage that's often mixed with vodka or gin and is sometimes even consumed on its own. Like most other fizzy drinks, tonic water is available in regular and diet varieties. Regular tonic water contains sugar, while diet tonic water products utilize a range of artificial and natural sweeteners, depending on the brand. Despite its name, tonic water isn't just water. Tonic water is made up of three main components: carbonated water, some type of sweetener and quinine. Tonic water's unique bitterness comes from quinine, which is derived from the bark of the cinchona tree. Quinine was historically used to prevent malaria. Today, it's more commonly used as an ingredient in soft drinks and other beverages. Because tonic water contains few ingredients, there are few nutritional benefits to drinking it. This beverage essentially has no nutrients. It has only some trace amounts of sodium, zinc and copper. Although it is primarily carbonated water, there are 32.2 carbs in tonic water (or 11 percent of the daily value you should consume each day) and 124 calories in 12 fluid ounces. The carbohydrates in tonic water essentially all come from its sugar content. According to the USDA Branded Food Products Database, the sweetener that's used in tonic water is usually high-fructose corn syrup, which is produced from corn starch. This means that tonic water is full of empty carbohydrates and calories. Sprite has 37.4 grams of carbohydrates (12 percent of your daily value) and 148 calories. A cola drink (like Coke or Pepsi) has 38.3 grams of carbohydrates (13 percent of your daily value) and 155 calories. Accordingly, drinking tonic water is basically like drinking any other soft drink and is certainly not comparable to drinking plain water. According to the Harvard T.H. Chan School of Public Health, drinks that contain more than 12 grams of sugar in a 12-ounce serving, like these, should be consumed infrequently. A 2015 study in the American Journal of Clinical Nutrition found a link between consumption of high-fructose corn syrup, the sweetener used in many tonic waters, and a greater risk of heart disease. Drinking beverages with this ingredient may also be related to health problems such as increased inflammation, arthritis and chronic bronchitis. If you like the flavor of tonic water but want to avoid the empty calories and carbohydrates, you can always try diet tonic water or other carbonated water products, which range from sparkling mineral waters to seltzers. 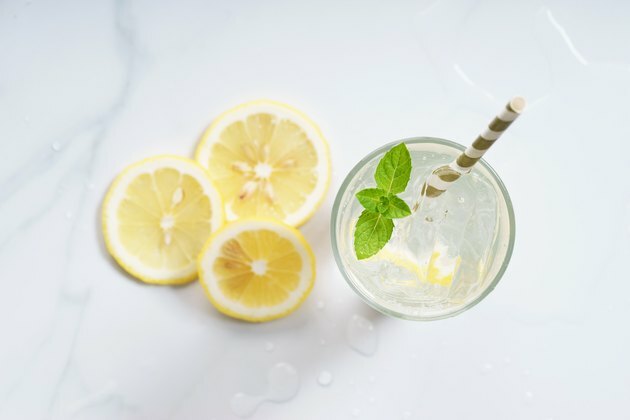 You can also try drinking sparkling water with lemon or even bitters, which are often added to tonic water, in order to mimic its signature bitter taste. Instead of sugar, diet drinks use a range of alternative sweeteners that can come from either natural or artificially produced sources. The pros and cons of drinking diet tonic water are based on the type of sweetener used in the beverage. Many major companies, like the Coca-Cola company, often sweeten their diet soft drinks with artificial sweeteners. For instance, Coca-Cola's diet tonic water, Schweppes Slimline Tonic Water, has aspartame. Canada Dry's diet tonic water, however, uses a different artificial sweetener called saccharin. Aspartame and saccharin are products that are tied to a history of controversy. Many artificial sweeteners have been thought to be bad for your health and to even potentially cause cancer. Today, the FDA considers these sweeteners to be safe, but research continues to question whether consuming artificial sweeteners is good for your health. Fortunately, some diet tonic waters use natural alternatives that lack these negative side effects. Stevia is a natural herb from South America that has been used as an alternative sweetener since the 1970s. Since 2007, a company called Zevia has used stevia to create sugar-free soft drinks. This includes a zero-calorie, zero-sugar tonic water called Zevia Mixer tonic water. Stevia is unique because it has compounds that are 50 to 400 times sweeter than sugar. Like artificial sweeteners, stevia is a zero-calorie sweetener, but unlike them, it has various health benefits. Stevia acts as an antioxidant that can help you lose weight, support your immune system and reduce inflammation and blood sugar. The only downside to stevia is a slightly bitter flavor that makes it taste distinctly different from sugar and other sweeteners. Due to its somewhat bitter aftertaste, stevia is not always considered to be the most desirable alternative sweetener. However, while this aftertaste might be undesirable in other beverages, it's perfect for tonic water as it works well with quinine's bitter flavor. Whether it's regular tonic water or diet, it typically contains quinine. Quinine has been used to help treat or prevent malaria since the early 17th century. Other treatments for this disease are now available, but quinine is still commonly used to treat malaria in many African countries. The quinine in beverages like tonic water is used as a flavoring and is limited by the FDA to 83 parts per million. This amount is well below the amount required for use in the treatment of malaria (tablets are sold in 500- to 1,000-milligram doses). This means that while quinine can help combat malaria, tonic water can't be used as a replacement for this or any other medical treatments. Because the levels of quinine in tonic water are so low, it's unlikely to cause problems as long as it's consumed in moderation. However, you should avoid drinking tonic water if you already take quinine in other forms, as too much can cause gastrointestinal and cardiovascular problems. Harvard Health Publishing: Harvard Women's Health Watch: Will tonic water prevent nighttime leg cramps? Indian Journal of Pharmacology: Artificial Sweeteners as a Sugar Substitute: Are They Really Safe? Is Diet Pepsi Good for Losing Weight? How Many Calories are in a Diet Pepsi? Is Splenda Good for a Low-calorie Diet?